No doubt about it, he is still one of the greatest contenders in the heavyweight division. And even though he's past 40, in a sport where wear and tear is the inevitable order of the day, Klitschko is still one of the greatest heavyweight Boxers ever. But even in this high note, his last opponent and current world heavyweight champion Anthony Joshua has told Wladimir Klitschko to retire. 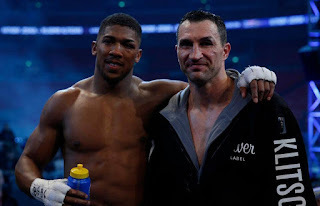 The 27 year old who won a grueling 11 round encounter with the Ukrainian has advised him to forget a heavyweight title rematch with him and hang up his gloves. His reason? It's time the veteran let younger challengers come through. The loss to Anthony had automatically triggered a rematch clause the 41 year old can exercise. But the downside is that Klitschko would be approaching 42 when any re-match of their epic battle could take place. Mean while AJ will still be under 30 with even more experience and theoretically, even harder to beat. In a revived division with the likes of Younger big men like Tyson Fury, Deontay Wilder and Joseph Parker, it might appear the veteran has his work cut out for him. And in a show of respect, AJ, would like to see the former ten-year champion step aside. He gave his opinion. While Speaking at a fans’ Q&A, Josh said: “If I was Wladimir I would fight again, the type of fight it was, he probably thinks he can beat me and he has nothing to lose. “If I was in his position I would fight again but I'm not Wladimir and I do not know what he wants to do. If the former champion decides to sign up for a rematch, the bout could take place before the year runs out.